Perhaps you don’t know but pierogi are a delicious delicious delicious meal. 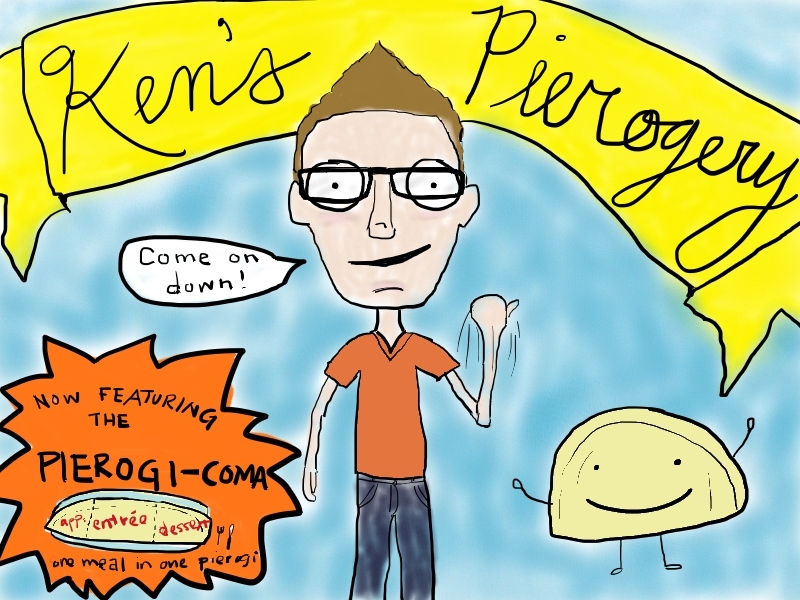 And last night, Adam’s cousin Sam hosted a Pierogi Party! It was fun…minus the manual labor part. Here’s how it works. If you want to eat delicious pierogi, you have to help make them. It’s actually not that bad, especially since Sam and her friend made all the ingredients ahead of time and did most of the work. Our job was to put together the fillings into the little dough pockets, which we had to construct. There was a bit of a faction between us pierogi-makers and for a while during the night I was going to run a competition pierogery, but by the end of the night we concluded that we can work together at his pierogery and make the Pierogi-Coma – a dish consisting of 3 courses all in one giant pierogi. We’ll let you know when the store front opens…. I love the term “pierogery”! What a fun party! Now I want to have one! Call me a pierogi pedant, but I LOVE LOVE LOVE that you used the word correctly and didn’t say “pierogies” (which is a double plural, since pierogi is already plural). I am glad you appreciate a little food grammar and I’m glad it made your day!